Wish I could play Renolock with this and Soggoth as the finisher instead of PO-Leeroy. Keep a Curator and Ironbeak Owl to silence Sylvanas. With the Grimy Goons' pathetic performance perhaps it is time to pink slip Cho. 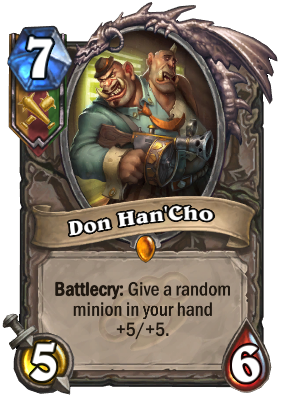 Pirates are the true third big faction in Gadgetzan. when they will add thesound of play,attack,die? Does everyone get this card with their first pack? My first legendary was a golden one too. I think the bug'd distribution in the first few hours of pack openning was making a lot of people own this card. I got it in my first pack and a second one later too. I opened 40 packs - during the bugged NA pack opening. Haven't found much use for it yet. This card is an offer I can't refuse.